Fast as a Silver Bullet! It could be argued that the 1930s was the golden era of the industrial designer in America. During the Depression, American manufacturers had to compete for limited consumer dollars. Industry leaders turned to a crop of former theater and graphic designers including Norman Bel Geddes, Walter Dorwin Teague, Henry Dreyfuss, and Raymond Loewy to restyle and re-engineer their industrial and consumer products to seduce clients and consumers. These four industrial design pioneers applied the “streamline” style, based on the aerodynamics of boats and planes, to such disparate objects as cocktail shakers, refrigerators, and tractors. No example of industrial competition is better suited to examination than the railroad industry. While Henry Dreyfuss served as design consultant to the New York Central Railroad and Walter Dorwin Teague designed for the New York, New Haven, and Hartford, Raymond Loewy worked for the Pennsylvania Railroad. Loewy, like his major competitor Dreyfuss, designed everything from the engines and passenger car interiors to the napkins and plates in the dining cars. The company logo on the engine was one feature in Loewy’s streamline redesign. This rendering of Loewy’s K4s Class engine shows Loewy’s redesign of the K-4 class locomotive, the first streamline steam engine of the Pennsylvania Railroad where he clothed the former engine mechanics in a sleek aerodynamic casing. The sketch cannot be considered a design drawing per se since the original 1936 Loewy-designed engine showed the PRR logo on the upper cowling of the locomotive. 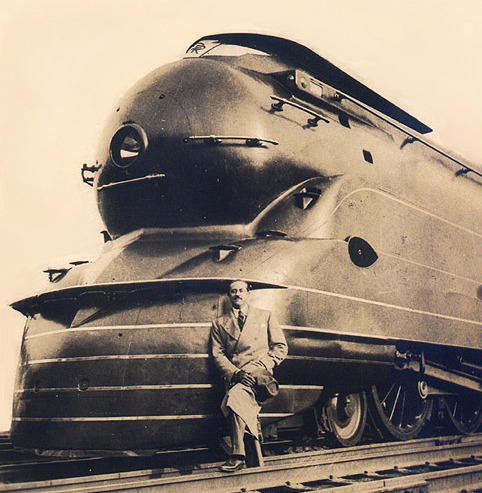 Loewy’s streamline logo with the PRR keystone and wings can be seen in an old photograph of the engine with Loewy proudly showing off his creation. The Cooper-Hewitt drawing represents a Loewy-office rendering after an earlier Loewy drawing with the revised positioning of the logo, flat with wings flamboyantly out-stretched above the headlight, emphasizing the smooth bullet-shaped nose and the train’s speed that Loewy and the railroad wanted to convey. The final Loewy logo can be seen in a color image of the train with the PRR keystone in red on a silver ground (rather than the traditional black, silver and red lettering/borders against a red ground) and silver wings. 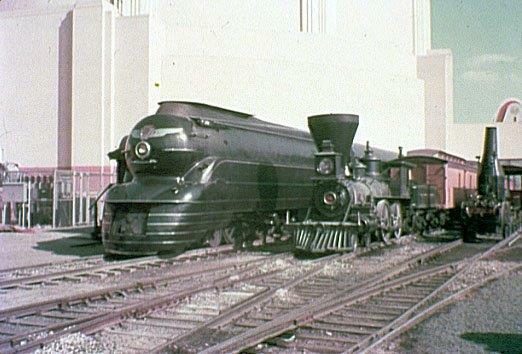 Loewy’s streamline K4s Class engine as well as his streamline S-1 locomotive were exhibited at the 1939-40 New York World’s Fair. Drawing: Rendering of K4s Class Locomotive with Final Placement of Winged Keystone Logo, for Pennsylvania Railroad New York, 1936-37. Designed by Raymond Loewy. Gift of the Pennsylvania Railroad through Samuel M. Vauclain, 1937-58-4.